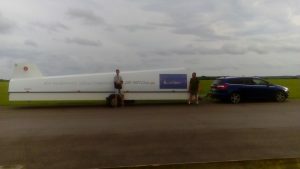 Essex and Suffolk Gliding Club collected the DG1001 Club Neo from Lasham on Wednesday afternoon (23rd of August) so that it can be put through two solid days of evaluation as a potential addition to the club fleet. 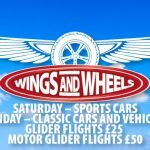 We hope as many members as possible fly it over the two days and give their feedback on this super machine. Pictured is Mike Haynes, club Technical Officer who has led on organising the loan of the demonstrator DG1001 and Toby Brown , club member,who helped Mike collect it. That enormous trailer towed surprisingly well behind Mike’s car which it dwarfed. Hi all we had at North Hill, Very nice does everything in the instructors manual to a T, also a good X/C tool !